MyBinding.com is proud to carry the full line of GBC, and Swingline 3-hole and 2-hole punches. We even carry a selection of single-hole punches. Choose from a variety of electric options for higher volume use, manual desktop models, or ultra heavy duty manual units. Whatever your needs, we are glad to assist you. Plus, these punches can easily be used with our screw posts and ring binders to quickly produce high quality bound documents. Check out the options below and feel free to give us a call, send us an email, or chat with us live if you have any questions. Carl Replacement Punch Kit for HD-530 - 9/32"
Carl Replacement Punch Kit for XHC-2100 - 9/32"
Carl Replacement Punch Kit for XHC-150 - 9/32"
Welcome to MyBinding video. MyBinding.com is proud to carry the full line of GBC, Bates and Swingline 2-Hole and 3-hole punches. 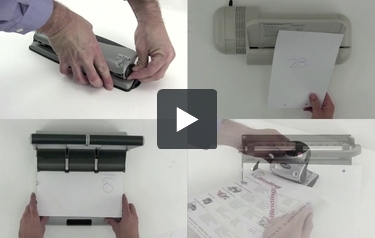 We have the simplest one-hole punch up to the large electronic three-hole punch for higher volume use. Our dedicated staff is here on the phone to help you find exactly what you need, and our website is laid out so that you can see everything. We have manual and electronic desktop punches, heavy-duty and light-duty. Many of our hole punches are customizable and adjustable to meet your specific needs with the best selection on the web and the guaranteed lowest prices. We strive to have a video for every product so you can watch it in action before you buy it. Let us be your source. When image matters, MyBinding.